A view near the newly established San Juan Islands National Monument. Photo: Bureau of Land Management. About us: The Puget Sound Institute is a cooperative agreement between the University of Washington, the U.S. Environmental Protection Agency, and the Puget Sound Partnership, seeking to catalyze rigorous, transparent analysis, synthesis, discussion and dissemination of science in support of the restoration and protection of the Puget Sound ecosystem. NOAA has released a draft report establishing a common monitoring and adaptive management framework for Chinook salmon recovery in Puget Sound. The report was prepared and written by an independent coalition of scientists known as the Puget Sound Recovery Implementation Technical Team. The group is administered by the Puget Sound Partnership, and includes representatives from NOAA and the Washington Department of Fish and Wildlife, as well as consultants and tribal organizations, with additional input from the Puget Sound Institute. We are pleased to announce the release of EoPS v. 2.0! 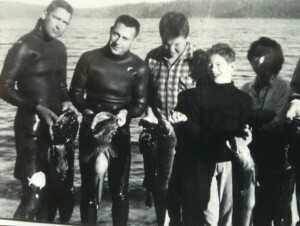 View the updated Encyclopedia of Puget Sound homepage at: http://www.eopugetsound.org/. 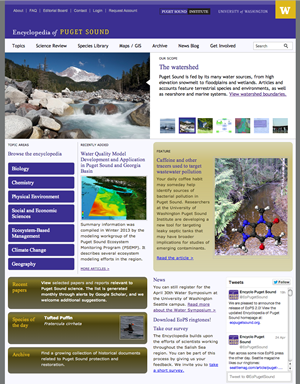 The page includes a new look and feel, updated navigation and regular features profiling the latest Puget Sound science. Puget Sound science owes a debt to the researchers and explorers who got there first. We profile some of these important figures in an occasional series we call Puget Sound Voices.